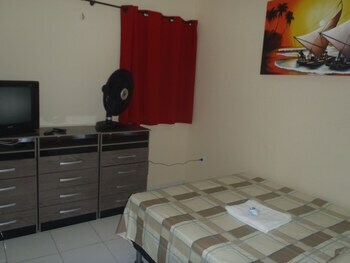 With a stay at Metropolis Pousada e Hostel in Fortaleza, you'll be near the beach and minutes from Ponte dos Ingleses, and close to Dragao do Mar Art and Culture Center. Featured amenities include dry cleaning/laundry services, a 24-hour front desk, and multilingual staff. A roundtrip airport shuttle is provided for a surcharge (available 24 hours), and self parking (subject to charges) is available onsite. A stay at Plaza Poços de Caldas places you in the heart of Pocos De Caldas, steps from Urca Cultural Center and Pocos de Caldas Cable Car. With a stay at Hotel Dalias in Guarulhos (Gopoúva), you'll be 14 minutes by car from Hall Tree Corner. Free self parking is available onsite.